Underwater wine tasting amidst the ocean's beauty. At Anantara, we believe in one-of-a-kind experiences. 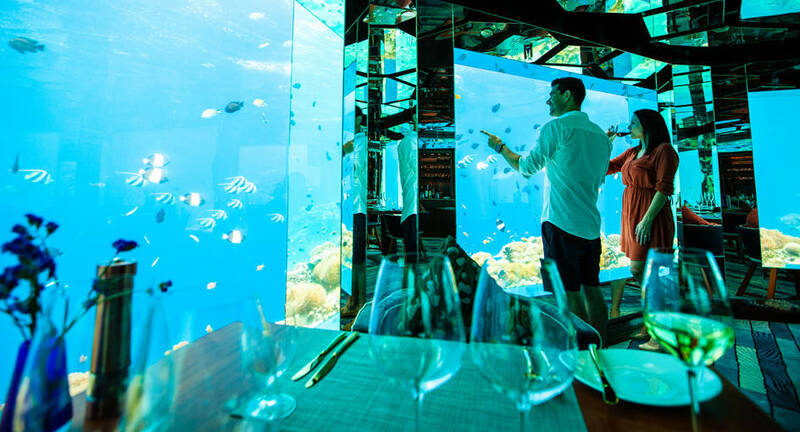 And at SEA, perhaps one of the only underwater restaurants in the world with an award-winning wine cellar, your tasting journey takes place in the most surreal of settings. Angelfish dart around the hexagonal space surfaced with mirrors, through swaying soft corals that dapple with sunlight. Allow our Wine Guru to design you a flight from around the world, or pair rare vintages with a meal prepared by the Executive Chef. Our cellar boasts over 450 bottles from two dozen countries and counting, presenting you with a choice as bountiful as our surroundings.